Flights to Pretoria are generally done through OR Tambo Airport. 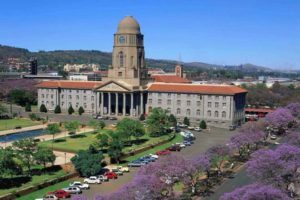 Pretoria is located in the northern region of the Gauteng Province SA and is fondly nicknamed the Jacaranda City because of the rich display of purple jacaranda blossoms within the region. Pretoria is also known for its rich historic background and was even the destination where one of the most complete skulls of an Australopithecine known as “Mrs Ples” which was found in the Cradle of Mankind. There are plenty of things to do once you land having journeyed via one of the many flights to Pretoria. Many visitors choose to enjoy the mouth-watering food and wine that is offered by popular restaurants and eateries in the region like Die Blou Hond (The Blue Dog) theatre restaurant, Le-Si Ristorante, Café Riche or Love Bitez to name a few. Apart from great food, drink and history, Pretoria also offers magnificent accommodation and outdoor adventures like horseback riding to name a few. The above flight times are merely estimates, to find out the actual duration, it’s best you enquire with the airline you choose to fly with. As with all flights whether domestic or international, some routes will require additional stops and the same can be concluded for flights to Pretoria. When travelling from certain regions there may be stops in-between destinations, and some flights may be more frequent a day or week than others. Flight ticket prices always vary from one to the other and airline to airline.